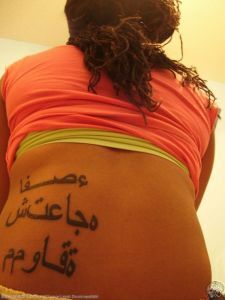 The Arabic Student: Thinking About Getting an Arabic Tattoo? Thinking About Getting an Arabic Tattoo? I love his designs! And the bad tats he finds are hilarious. Well, for us. Not so much for the people who decided to get something tattooed on them in a language they don't know. Please please please keep up the great work!!! I love EVERYTHING you've done so far! Hilarious. How do you say Schadenfreude in Arabic?